Auxiliary verbs are also known as helping verbs, because they help form compound conjugations, meaning compound tenses like the passé composé as well as compound moods like the past subjunctive. The key thing to remember about compound conjugations is that there are two verbs: the auxiliary verb, which conjugates for the required tense or mood, and the main verb, which is always in the form of the past participle. French has only two auxiliary verbs. Avoir is the auxiliary for the vast majority of French verbs, but there are a number of notable exceptions for which être is the auxiliary. 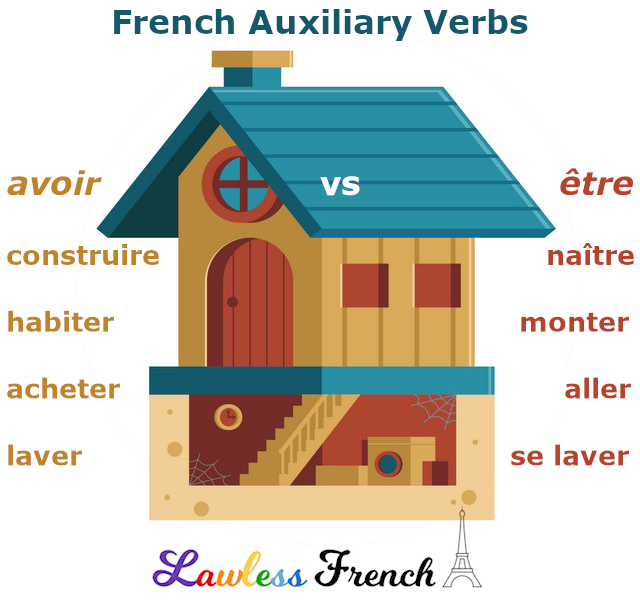 Whichever verb it is, the auxiliary is consistent for all compound conjugations: avoir verbs always take avoir as their auxiliary verb for all compound tenses and moods, while être verbs always take être. However, there are a few verbs that can take either auxiliary, depending on how they’re used: learn more. * Intransitively = without a direct object. Most of these verbs can only be intransitive, so they always require être as the auxiliary. But eight of them can be used transitively, and when that happens, they need avoir – learn more. Être verbs require agreement in all compound tenses. With practice, you’ll get used to these verbs and know instinctively that they require être, but for right now, you might find one of these mnemonic devices helpful. 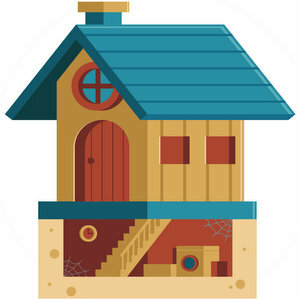 Native French-speaking teachers teach être verbs by having students draw a house with a door, windows, at least two rooms, and a staircase, and then label it with the être verbs. For example, draw a figure passing in front of the house (passer), another entering it (entrer), and a third going upstairs (monter). DR & MRS VANDERTRAMP seems to be the standard mnemonic device for être verbs in the United States. I don’t like it – I think including the derivatives is silly, but whatever works for any given student is all that matters. Also note that passer is missing. Each letter in ADVENT stands for one of the verbs and its opposite, and then there’s one extra verb. Once again, passer is missing. Each letter stands for one of the 13 verbs. As always, passer is missing. Note: You must be logged into your Progress with Lawless French account to take these tests. If you don’t have one, sign up – it’s free!